For over 80 years, the University of Idaho Experimental Forest has provided a working forest classroom in which students can work and learn. The management units, natural areas and outdoor classrooms provide the connection to field-based education, faculty and graduate research. College of Natural Resources public outreach workshops and field tours help to support and fulfill the land-grant mission of the University of Idaho: research, teaching, and service. Hiking, mountain biking, horseback riding, and cross-country skiing are great ways to explore the forest's roads and trails. Visitors are encouraged to explore nature trails at the Hemlock Natural Area at Flat Creek, Big Meadow Creek Natural Area and East Hatter Creek Natural Area. We welcome any and all who would like to spend some time in the woods. Please follow signs or contact the Experimental Forest Manager to make sure you do not interrupt research activities. No motorized recreational access of any kind is permitted on the Experimental Forest. No target shooting is permitted. All hunting on the Experimental Forest requires a no-cost permit. During Fall 2018, permits can be obtained from the Experimental Forest office in Phinney Hall B-15 from 2:30 - 5:30 PM Monday through Friday and 8:00 -10:00 AM Monday and Wednesday. For a map to the office location, click here. Because of their small size and heavy recreational use, hunting is not allowed at the Roger Guernsey Outdoor Classroom (Pinestia), Blodgett Outdoor Classroom, or Big Meadow Creek recreational area. Matt Bruce explains what he's learned working here. Matt Bruce, talks about his experience and the skills he's learned. Perfect opportunity to earn some cash and spend your summer in the woods. How we integrate hands-on learning into our programs. Opportunities to conduct experiments in a local setting. To check on availability of the Flat Creek Cabin, email Kassandra Townsend. Flat Creek is a popular hunting destination. Hunters must park at locked gates and walk in. Off-highway vehicles or target shooting are not allowed anywhere on the UIEF. The Experimental Forest is a network of eight properties, including management units, tree farms, outdoor classrooms and natural areas gifted to the College of Natural Resources for forestry research, teaching and demonstration purposes. The Big Meadow Creek Unit is located on the south side of Moscow Mountain. The majority of the parcel was part of the original gifting of Latah County units that occurred during the early 1930's. Although the buildings are now long gone, Big Meadow Creek was once home to Civilian Conservation Corps (CCC) Camp S 260, and many of the direct-seeded and planted stands originated during restoration efforts carried out by the CCC. Maps and detailed records of the original seeding and planting units are on file in the Experimental Forest historical archives in Phinney Hall B-13 and B-17. East Hatter Creek is home to the 249 acre East Hatter Creek Natural Area. From the late 1940s to the mid-60s, much of East Hatter was home to a large deer enclosure used for a variety of short and long-term wildlife management research by students and faculty in the Department of Fish and Wildlife Sciences. This management unit along the West Hatter branch and Long Creek tributaries to the Hatter Creek drainage range from productive stands in Western red cedar and grand fir habitat types on north-facing slopes to Ponderosa pine and Douglas fir stands on southern slopes at lower elevation. West Hatter is a popular location for outreach and extension activities, and is located near Princeton, Idaho. The Flat Creek Unit is home to two of the Experimental Forest's natural areas. Flat Creek Natural Area is located on the north side of Highway 8, just west of the railroad bridge at the Road 11 entrance. Hemlock Natural Area is located approximately 4 miles on Road 12. Road 12 is accessed on the south side of Highway 8. The Flat Creek Cabin on Road 11 (also called The Cabin Road) was built in 1949 as a research station for field experiments and group outings in the forest. The Roger Guernsey Outdoor Classroom (also known as Pinestia) was gifted to the College of Natural Resources by former state forester Roger Guernsey, to provide a demonstration area illustrating principles of small woodlot management. Cathedral Ponderosa pines are interlaced with clusters of young regeneration in gaps. The current standing volume of timber at Pinestia is approximately equal to the volume that has been harvested over the last 30 years. Heading east on Highway 6 in Princeton, turn north (left) onto Gold Hill Road. Continue for approximately 1 mile, and look for a small gravel driveway access surrounded by large Ponderosa pine trees on the left. As you enter the parking area, look for a black mailbox on the right. In this mailbox you will find pamphlets leading you on a guided tour of the property that covers the unique features of its history and management. The 80-acre Blodgett Outdoor Classroom was gifted to the college by Earle and Eva Blodgett in 1988 to provide a teaching classroom close to the Moscow campus. Students in silviculture, ecosystem processes, and forest operations regularly use the classroom for field labs. The annual Future Farmers of America (FFA) statewide Forestry Career Development Event is hosted at Blodgett. 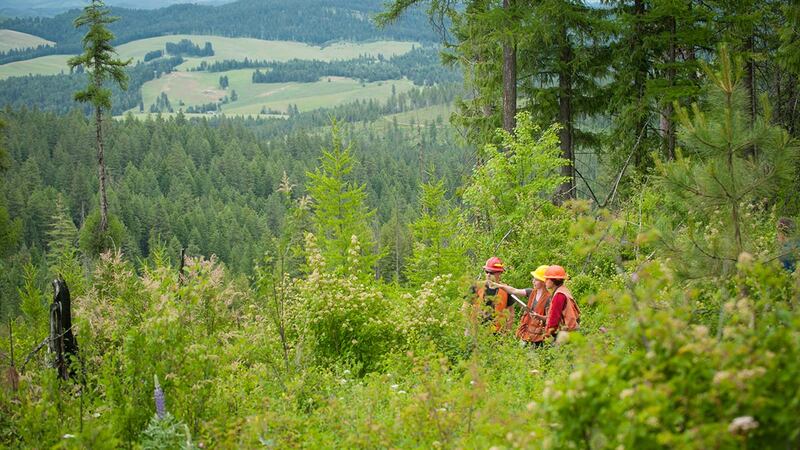 The Matthew M. McGovern Memorial Tree Farm provides an ideal location for Extension forestry workshops in the Cougar Creek drainage, close to Coeur d'Alene. Mary Alice McGovern gifted this 238-acre property to the college with a primary objective of demonstrating forest management techniques. A log kiosk approximately 600 feet in from the UIEF forest access road gate describes the McGovern family, the property's history and current forest management goals. Class I Stream Shade Rule Demonstration Area: Idaho's new Class I Stream Shade Rule went into effect in June 2014. For more information about the rule, please visit the Idaho Department of Lands fact sheet. The College of Natural Resources is working closely with Idaho Dept. of Environmental Quality and Idaho Dept. of Lands to install new demonstration areas on the Experimental Forest to show small landowners, foresters, and contractors how tree marking to comply with the new rule works, and how different treatment options may look after harvesting. In Fall 2014, pre-treatment shade was sampled every 3 meters along a 1,200 foot reach of Cougar Creek using a Solar Pathfinder, and all trees were measured to determine Relative Stocking in 50 foot intervals. Treatments demonstrating the two Shade Rule options (60/30 and 60/10) will be installed in winter 2015, with signs showing pre- and post-treatment measurements. Please contact Forest Manager Rob Keefe for more information. The 1,650 acre Herald Nokes Experimental Forest in McCall is currently managed by the Nokes family with management help from the College. Eventually, management will transition to the Experimental Forest and continue the legacy of forest stewardship at this special place.